See? A totally legit garden with tomato cages and everything. I built a garden in my backyard. It is not a very big garden, only eight feet by four feet. Thirty-two square feet of garden-scape in my back yard. I am living the dream. It is a modest dream, in some ways, but quite grand in most others. When I say “I am living the dream”, I do not mean to imply that it is my great life’s dream to have a garden the size of a sheet of plywood in the back corner of the yard where the sun shines most. I mean that I am actively walking down the road that leads to my dream. I am not living in a dream. I am living a dream into being and this little garden is part of the first step. 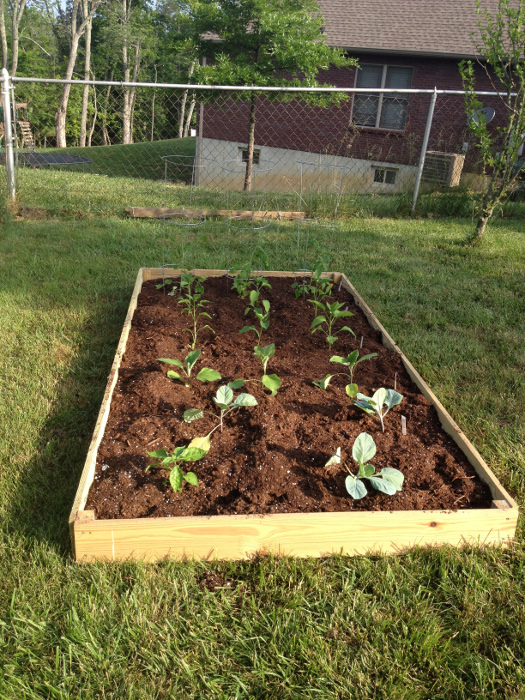 This garden will grow, as garden are said to do, into a bigger garden (I am already planning the next bed, and a smaller bed for our son to play in and learn in), and hopefully teach us a few things along the way. And give us lots of delicious fresh fruits and vegetables and such. That would be a big bonus too. I actually took a piece of 4×4 left over the compost bins and cut it lengthwise into 2×2 pieces, and used left over 1×6 boards from it as well, so the only thing I had to buy was a dowel rod and a set of wood drill bits, but I was looking for an excuse for that anyway. Now, I drilled about a 2″ hole into the bottom of the four 2×2 pieces. Next I inserted the dowel rods into these holes to serve as anchors when we put the constructed garden in place. Now, being careful to keep all four of the dowel rods pointing the same direction I began screwing the 1×6 boards to the 2×2 corner pieces. Really this is pretty intuitive. You are just building a rectangle of whatever size area you have. It is a good idea to keep your beds thin enough that you can reach past halfway across from the sides. So if you are shorter or have shorter arms, maybe only do a three foot wide garden. So, now I positioned the garden in the yard where I thought it should go, then asked my wife for her opinion. We took way too long to decide on a spot about three feet from the original location, but it was a pretty hilarious time with us moving the frame of the garden around and talking ourselves into and out of different layouts of this and other hypothetical beds in the yard. Once we decided we had the perfect spot, we pushed the four corners into the ground and suddenly the fun part was over for a while. Now that the frame was set in the ground, I began cutting out and removing the sod and trying to cultivate the top soil left behind somewhat. My goal was to basically dig about four inches deep total, giving me a ten inch deep root zone. I would give some advice on how to do this but I did not find a really easy way. I can give you few nuggets that I learned though. wear gloves. like the whole time. seriously. it is never too late to start wearing gloves. seriously. I used a garden rake to break up the top soil as much as I could with my screaming hands, and then stirred in three of those big 3.8 cubic foot bags of sphagnum “growing medium” and two bags of “Moo-nure” cow manure based compost/fertilizer that I picked up at Home Depot because it looked better than all the Miracle Grow stuff they had at least. My hands hate me. I didn’t wear gloves. I’m an idiot sometimes. 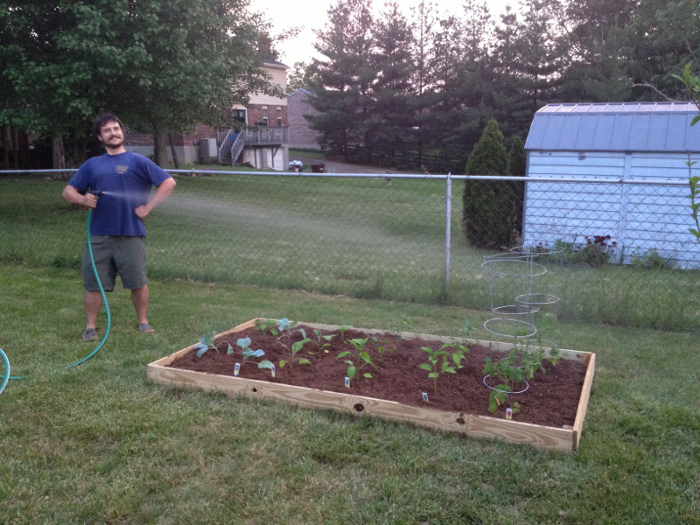 Okay, hands are probably going to be amputated, but, whatevs, I got a garden, y’all! Now for plants. Don’t just stand there. Spray something! 2 Responses to "A Garden Grows in Burlington"
That is one fine looking garden. Can’t say as much for the guy with the hose :-). I also recommend container gardening for tomatoes. If we have an early frost, they can be brought inside and you have tomatoes longer (unless you do mega-containers then good luck dragging those things inside).